Not just any old cheese and onion chip. 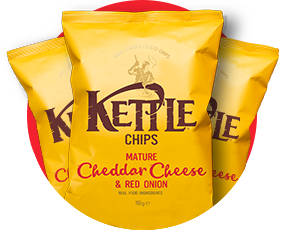 Here the distinctive tang of Mature Cheddar is complemented by the sweetness of red onion to create a perfect partnership. Potatoes, sunflower oil, dried buttermilk, dried mature Cheddar cheese (milk), sea salt, dried red onion, dried yeast, yeast extract, dried chives, paprika extract.